Which do you prefer? 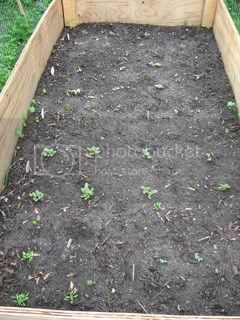 This is my first time vegetable gardening & I used seeds. I'm practicing a lot of patience. I'm considering buying plants next year. This is how it looked when I first planted. (this is very basic) I used a seed starter kit/greenhouse type thing before planting. This is how it looks now, about a month later. My radishes are looking good, but I'm having issues with weeds. I did not put mulch down because I did not want to bury anything. Do you think its safe to mulch now? Yes definitely ok to mulch now. You are right you didn't want to mulch over your newly planted seeds and early in the season you want the soil to warm up; mulch slows that down. Now you can get all the weeds out then lay down mulch and that will help keep the soil cooler and moist-er through the hot season. Seeds vs plants depends on what you want, what your time vs money equation is etc. Buying started plants and just popping them in the ground is definitely easier and less time consuming than starting and nurturing seeds (indoors or out). Seeds are WAY cheaper and give you more control. Buying plants, you don't know how that plant has been treated and what it has been treated with. It also depends on timing. To do seeds, you have to plan ahead and start early. If you suddenly discover it's June and somehow you haven't done anything in the garden yet (I've had years like that; it's amazing how having to work can interfere with gardening! ), then go buy plants. 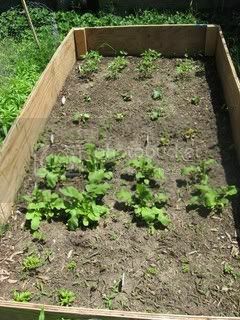 Generally the idea of building a box like yours is to make a raised bed. I'm not quite sure what purpose yours is serving. But for next year, I'd fill it all the way up to within an inch or two from the top with good enriched topsoil. Your plants will love it. Thank you for your reply. I think I missed the entire "raised" part of building your own garden. I guess for now, it makes a pretty good barrier for my dogs. I have so much to learn! Any particular type of mulch I should be using? Anything organic you have on hand or can come by easily. Grass clippings from the lawn work well. They can deplete nitrogen from the soil in getting broken down, so at some point you may need to be adding the nitrogen back. Could be straw, could be fall leaves if you still have any around. If you have a compost pile, you can use your compost as top dressing/ mulch or use purchased compost the same way. Coffee grounds. Wood chips, bark chips, pine straw, ground up corn cobs, peanut hulls. Layers of newspaper or shredded paper works, but is pretty ugly, you'd probably want to put something else down over the top of it for looks. This was my first year starting seeds indoors before it was time to plant. I have to say I definately have enjoyed watching the plants grow that started from seed more than the others. It seems like so much more of an accomplishment seeing them do well. Also I found it to be a nice lift in the winter to be growing something inside. Got me all geared up for the summer! I only buy plants for tomato, peppers, rhubarb, and strawberries, sometimes onions (plants or sets). Everything else I start from seed planted directly in the garden where it will be grown. Costs much less, and it usually grows just fine. where to buy seeds and plants? Where do you get your seeds\plants from? I don't trust the Plants & Seeds I buy anymore.